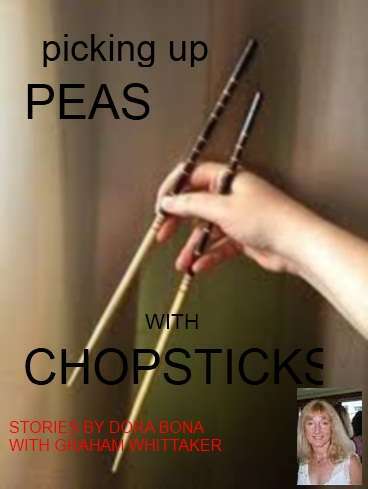 Picking UP Peas With Chopsticks is a new anthology for those of you interested in the fun of Creative Writing. There are 34 short stories in this book. Dora Bona, a creative writing tutor, and travel journalist contributed to this anthology with novelist Graham Whittaker. Each story was a given theme in one of Dora’s classes. One of the problems of the age of social media and instant networking has been the falling off of concentration spans with readers. A novel now has become a big drain on time. On the other hand the short story has made a huge comeback. Not very long ago the short story had fallen into obscurity. Magazines no longer paid for short fiction, and the market dried up. With digital publishing and the burgeoning ebook market, the short story has found a new and popular niche. You can read a story on the train, bus, in the car (when you are not driving!) It’s a bit like having a mini-meal and feeling satisfied. Personally I’ve always liked the short form because it’s difficult…much more difficult than writing a novel. With a novel you have time to tell a story, develop characters, and, to an extent, stretch out the imagery. The short story doesn’t give that luxury. That’s part of the fun in the writing though. That so many people consider short story writing first, possibly out of a sense of laziness, is confounding. Have a look at Picking Up Peas With Chopsticks. You can get it at Smashwords for $2.99 and at just shy of 70,000 words it’s a bit like a recipe book of genres. Thank you Jennie, Most appreciated. I update regularly, but not as regularly as I should!